Grades 1 - 2. 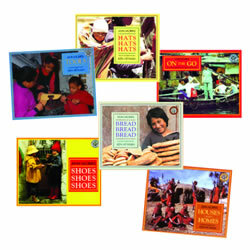 Ideal for both independent and guided reading. 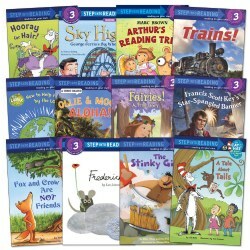 Includes 5 leveled books. Label is included. 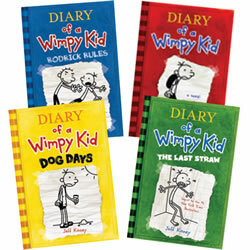 NOTE: If a book becomes unavailable, a suitable substitute may be found to complete the set. Favorite stories from multiple cultures. 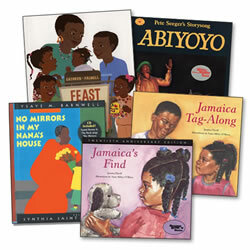 Includes: "Feast for 10", "Abiyoyo", "Jamaica's Find", "Jamaica Tag-Along", and "No Mirrors in My Nanas House". 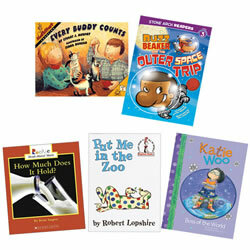 5 books with CDs. 3 - 6 years. Educating children about how to identify and handle their emotions is as important as other kinds of learning. 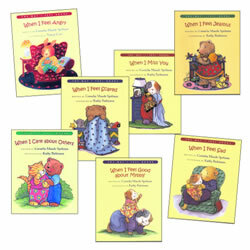 These books use simple and reassuring language to help children understand and manage their feelings and relate successfully to others. 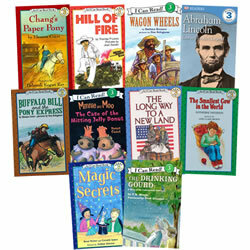 Set of 7 paperbook books or individual titles. 24 pages each. This round-the-world photographic book set introduces young children to the concept of the world's people, the places they live, and how they work and play. 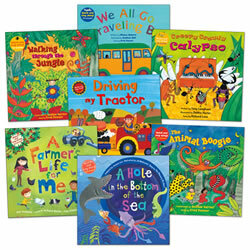 Each book tours the globe to develop a strong interest in cultures and ethnic heritage while showing differences in young children. 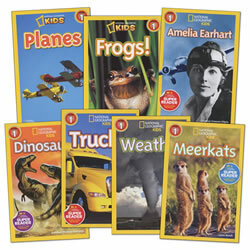 Improve student comprehension and fluency with these multi-format CD and book sets. 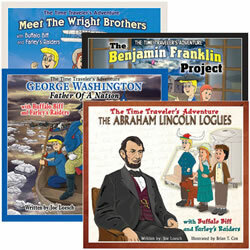 Each history-rich story is written in script format and includes a CD with 4 different readings. 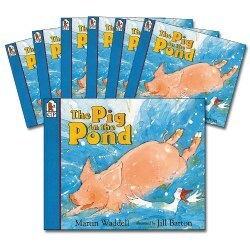 The first is a supportive, word for word reading, to model and build student confidence. Each of the 3 additional readings leave out the lines of a main character and allow time for the reader to fill in the part as they follow along. Grade 2 & up. 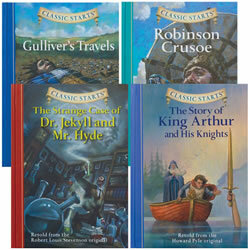 Classic Start Books combine the wonder of timeless stories with easy to read text. 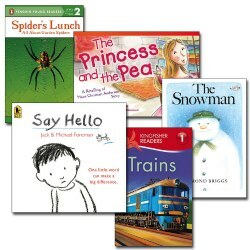 These abridged classics have been carefully rewritten to retain the rich character of the originals, while making them accessible to young readers. Available individually or in a set of 4. Hardcover. 160 pages each. 6 - 9 years. 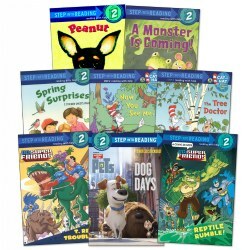 Reader-friendly format, on-target humor, and convincing depictions of third-graders in action at school and at home will have easy-chapter book readers lining up for never-ending adventure. Sold individually or in set of 8. Paperback. Grades 2 & up. 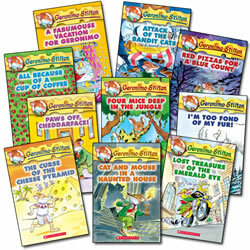 Young readers will delight in the adventures of this 'fraidy mouse caught up in life's excitement. 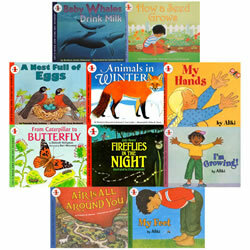 Set of 10 books or individual titles. 3 years & up. Students compare the similarities and differences as they learn about the life cycle of these insects. 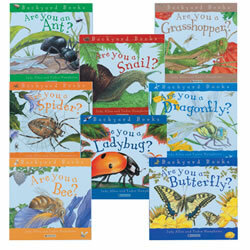 Each book describes how they hatch, develop, and live in their environment. Paperbacks. Grades K - 5. 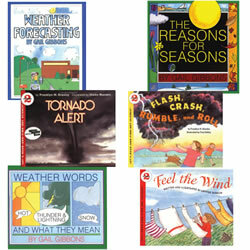 This 6 book set covers topics including temperature, humidity, wind speed and pressure, how meteorologists gather data for their forecasts, and the origin and nature of tornadoes. 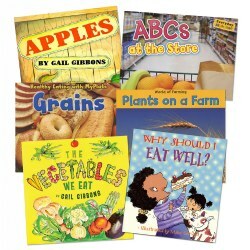 From the ABCs at the store to plants on the farm, this set explores foods from the farm to the kitchen. Real photographs and illustrations in rich vivid colors show a rainbow of fruits and vegetables every child will want to try. 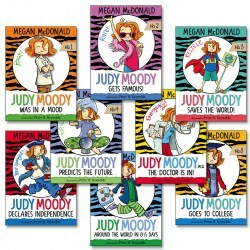 Set of 6 paperback books or individual titles. 3 years & up. 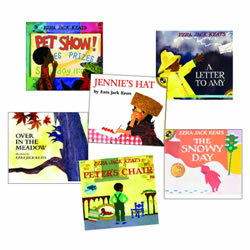 These books will bring playful stories with familiar themes to life in your listening center. Set of 7 or individual titles. Grades K - 2. 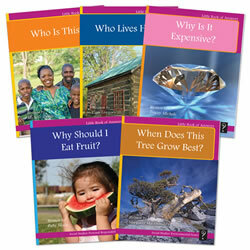 Start with questions and get Little Books of Answers! 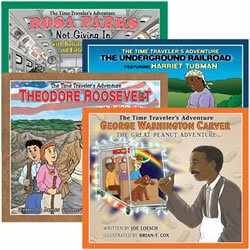 This comprehensive guided reading program uses the questions Who? What? When? Why? And How? along with balanced literacy and guided reading strategies to turn beginning readers into independent readers with literacy skills and content mastery. Grades 1 - 3. 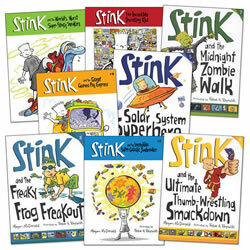 Stink may be super smart, and Stink may be uber clever, but that doesn't keep him out of trouble! What will he get into next? You have to read to find out.